Tonight, the 2012 BRIT Awards will take place live from The O2 Arena in London. This is the 32nd edition of the annual pop music awards. Leading the nominations is Ed Sheeran with four, Adele and Jessie J have three, followed by Bon Iver, Coldplay and Florence and the Machine with two. Olly Murs, Adele, Bruno Mars, Coldplay, Ed Sheeran, Florence + The Machine, Noel Gallagher’s High Flying Birds, Rihanna and – with their first performance in almost three years – Blur will perform live on tonight’s show. The main ceremony, presented by James Corden, begins at 8pm on ITV1 and ITV1 HD. Keith Lemon and presenter Laura Whitmore will host ITV2’s The Brits Red Carpet at 7pm, where the pair will report live from the red carpet. They will be chatting to the nominees and performers as well as giving viewers a special look behind the scenes before the awards. 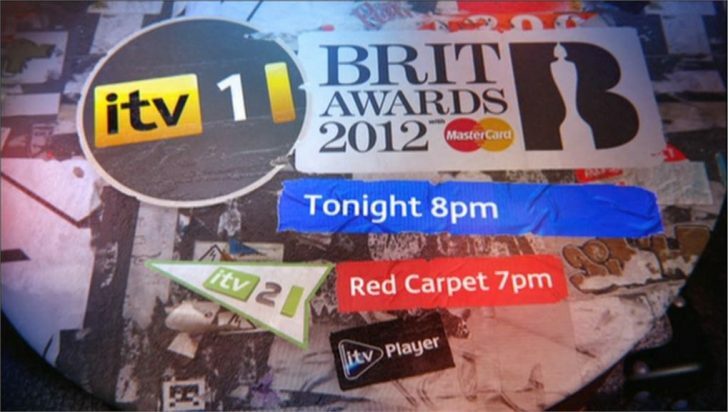 After the main show on ITV1, Keith and Laura will return on ITV2 with The Brits Backstage. The duo will get all the action backstage as they catch up with the latest gossip and glamorous outfits, and get on the spot reactions from the night’s winners, losers and VIP guests. The programme begins at 10pm.